You are guided to be patient. We know that Divine Timing is perfect – yet it seems difficult to wait and sometimes it even feels that Heaven doesn’t realise the urgency of the matter! Be still dear one, have patience. There are other circumstances and events unfolding that you may not be aware of. There are Divine Beings working on your prayers as we speak. See them in your mind’s eye working behind the scenes. What is time? Is time really that important? Does it not matter more what we DO whilst waiting for Divine Timing? How we act, speak and think whilst waiting? Time is irrelevant. It is the events that need to unfold. Learn to deal with reality as it unfolds for you now. As the seasons come and go, as nature restores itself, miraculously and always on time, so it will be with our lives too. As something ends, something new is beginning, a continuous cycle of events. Perhaps time is in your control – you control whether to rely on Divine timing and let all else go. 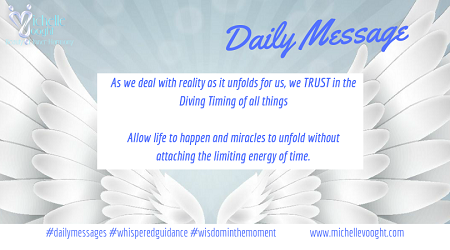 Let go and let God work the answers to your prayers, allow life to happen and miracles to unfold without attaching the limiting energy of time.